The perfect accessory for loitering. You’re leaning against the lamp post, zipping it down and up, down and up, down and up, down and AROUND THE WORLD, WALK THE DOG, CATS CRADLE, GUILLOTINE, TRAPEZE, RIPCORD, TETHERED TODDLER, BUCKET O’ CLAY and up, down and up, down and up. Your not even trying to be cool but the yo-yo just can’t help itself. 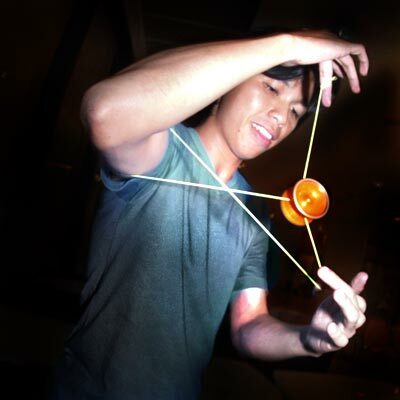 One part Filipino weapon, one part West Side Story prop, the yo-yo is the very essence of “just hanging out”. Eventually you can get this good…. This entry was posted on September 8, 2009 at 10:13 am and is filed under skills, sweet videos. You can follow any responses to this entry through the RSS 2.0 feed. You can leave a response, or trackback from your own site.